Sarah Graham is a UK based photorealistic artist whose distinctive oil on canvas paintings celebrate nostalgia and childlike wonderment. Combining vivid colours and realism, Graham favours kitsch images of toys, sweets and adolescent subject matter to create an elusive sense of sheer joy. Her remarkable talent, dedication and genuine enthusiasm for her craft is reflected in her incredibly detailed work. Graham will arrange subjects in her studio and take up to 200 hundred photos before deciding on the right composition. Once arranged, she will use oils to capture light and shadows on her subjects and recreate the blurring seen in objects photographed out-of-focus. To browse original work for sale, as well as limited edition prints, please visit our Sarah Graham artwork page here. Sarah Graham’s photorealistic canvases are flamboyant compositions designed to capture the viewer’s eye, but behind each playful piece is a serious dedication to the craft. Born in Hitchin, Hertfordshire in 1977, Graham’s artistic endeavour was present throughout her childhood. She was encouraged to paint as a remedy for boredom during weekends and school holidays, a pastime that would soon blossom into a lifelong passion. 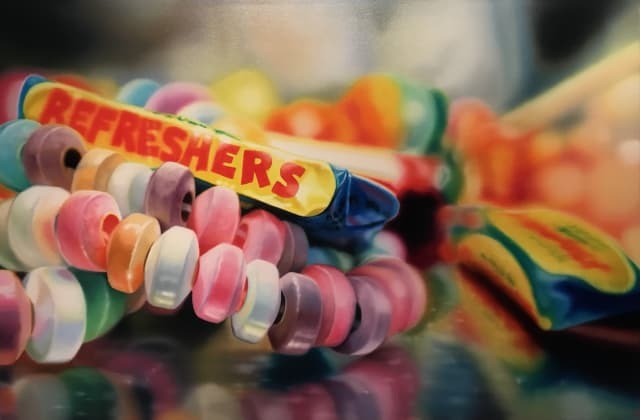 Although Sarah Graham’s art continuously conjures up sentiments of childhood, it was actually during her time studying a BA in Fine Art at De Montfort University that photorealism really captured her imagination. While working at a pub to help fund her studies, she organised her first exhibition. Using an empty space above the pub, Graham set up a gallery with other students where she could display and ultimately sell her work. After graduating with a fine art degree, Graham spent several years exhibiting at independent galleries and art fairs around the UK. It wasn’t until 2007, when she signed with a major art publisher, that her career really took off. Along with original paintings, her work became available as limited edition prints and was soon featured in newspapers and magazines. She appeared on television and radio, often portrayed as the girl who went from selling pick n’ mix sweets in Woolworths for pence, to an established artist selling pick n’ mix sweets on canvas for thousands. Graham’s work is a celebration of nostalgia and childlike wonderment, which is only amplified by her obsession with colour which she uses to such spellbinding effect. Flea markets, sweet shops and E-Bay are just some of the places where she finds objects of inspiration. Working from photographs, Sarah will sketch the outlines of her subjects in yellow paint to create the basis for the painting, before adding a spellbinding blend of colour and technical intrigue. Since stepping into the limelight, Graham has gone on to feature in private collections across the world. In 2012, she was commissioned by British indie-rock band Kaiser Chiefs to paint the album cover of their singles collection Souvenir. Her artwork has also featured on the GCSE syllabus, inspiring the next generation of artists and introducing them to the photorealism genre. Nonetheless, she remains incredibly grounded, working part time in art gallery and regularly running workshops from her studio in Letchworth.